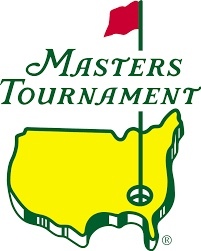 This will be my 35th Masters as a credentialed media member. It’s the best competition in not only golf but in all of sport. And just don’t take my word for it; check out the comments and quotes from those veteran sportswriters and columnists who cover all of the major sports and the Olympics. They all agree upon one thing: the Masters is the best. I guess that’s why after all of these years in golf I still get the most inquiries about my week at the Masters. So to save my wind for the daunting slopes and hills of Augusta National (the Tour caddies insist it remains the most challenging walk of the year) I’m gonna be proactive answering the most commonly asked questions. How did you get credentialed? In 1984, as founding editor of Michigan Golfer, I submitted a letter to the Masters requesting a media badge. Fortunately, MG had been honored in consecutive years by the National Golf Foundation as the best monthly newspaper in the country. Soon after, I received a letter from the Masters granting me a credential. A few years later, I was surprised and quite proud to find a cover of Michigan Golfer as part of a framed press collage of articles and photos about the Masters in the Press Building. What’s your desk and seating like? All the comforts of home and then some because the Press Building is palatial. With plenty of outlets, each desk has its own monitor where you can watch various channels, both broadcast and closed circuit. For example, there’s a dedicated channel just for the interview room (one level down). If I’m in the middle of writing and don’t want to be disturbed, I can put on headphones and listen to the interview without taking a step. There’s also dedicated channel for selected golf holes. Each desk has its own small locker to store and safeguard items. After 34 years, I’m also blessed with the last seat in a row with an unimpeded view of a giant TV screen on the near wall. But alas, there’s no Lazy-Boy. Do you get into the clubhouse? Yes, my media badge allows me access to the main clubhouse. However, the second floor Champions Locker Room is off-limits. But I have peeked into it. This second floor also has a dining area inside and on the veranda where members, patrons and media may order off the menu. For many years, some of my media pals and I would have at least one lunch up there. I’ve dined next to Gary Player, Billy Casper, Gene Sarazen, uber-agent Mark McCormick, et al. I always like to look around the clubhouse and scan the impressive photographs and memorabilia. Over 20 years ago, there was a brass plaque on a wall facing the first floor receptionist’s desk that listed all of the Augusta National members currently on the property. I took out my notebook and jotted down some names, one of whom was Roger Smith, the past CEO and chairman of General Motors. That plaque is long gone, at least during Masters week. Where do you like to watch the action out on the course? First off, I always carry a small pair of binoculars. And over the years, I like to roam around to various observation stands where I can sit, preferably in the shade, and watch the parade of players go by. My favorite holes are no. 1, no. 5 (it has a large concession area nearby), no. 8, no. 12, no 14 (a magical green) and near the tee at 16. Inside tip: get a seat where you still see the scoreboard so you know what’s going on. I rarely chase players although I do like to get behind the par-five 8th tee and watch the long hitters drive off. In Tiger’s prime and even now, one would have to get there at least two groups before Tiger arrived to get a good spot. It’s worth the wait to see Dustin and Rory blast it and now Cameron Champ. By the way, besides the binoculars, I always carry a pairing sheet and a spectator guide. Are the concessions and facilities that special? Yes! Invariably first time patrons marvel at the efficiency of the concessions and the restrooms. That’s the advantage of hosting the Masters since 1934. They keep getting better at it. There may be lines at the Masters but they all move. And yes the concession prices remain very affordable. There’s no gouging at the Masters. And patrons are polite, patient and always on their best behavior. 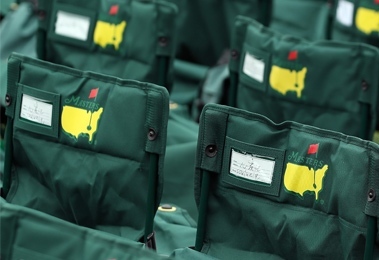 What’s your opinion of the Masters “no digital device” rule for patrons? What’s the nightlife like for you? Believe me there’s no “Golf Writers Gone Wild.” One year I did lose my way driving on a dark and stormy night (like Snoopy) and my sub-compact rental car got stuck on a railroad track and blew out three tires. As background, it’s a notorious and dangerous stretch of road that has claimed many an out of town driver. Luckily, a group of chefs (I’m not kidding) from a nearby catering commissary lifted my car off the tracks and back on the street before the train arrived. They admitted they had done it before. One Michigan writer with the initials JB shipped me a train engineer’s cap afterwards. The big parties for writers that week are the Golf Writers Annual Awards dinner on Wednesday, Tourism Ireland’s party on Thursday night, and the PGA of America’s media party on Friday night. All of them are grand affairs and I get to catch up and interact with a variety of friends in the business. Despite it being a near six-hour round, it was a memorable experience. And I had a kick-in birdie on the par-five second hole. What’s your routine on Sunday? My routine is pretty standard among most writers. 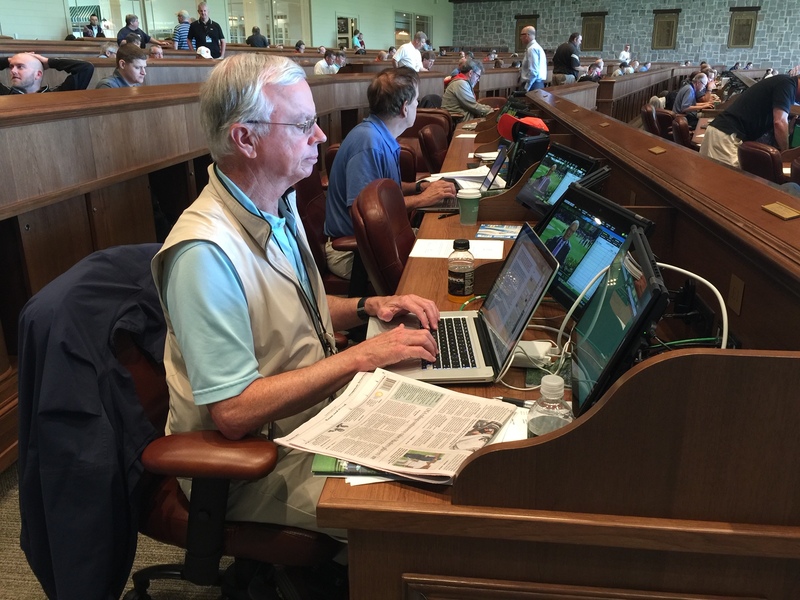 After checking in at the Press Building, I catch up on emails and the morning papers, I head out to the course and watch the action on the front nine. I rarely follow the leaders on the back nine. Instead, I head back to my seat in the Press Building and watch the final two hours of drama unfold on television. To get the complete story across so many groupings, television can’t be matched. One nice advantage of the personal monitor on my desk is that I can flip back and forth between CBS and the Sky Sports European feeds to get multiple coverage. Often, I’ll wait until the champion makes his appearance in the Press Building for the final interview for the gathered media. The joy, elation and relief of the green-jacketed player realizing he’s won the Masters never gets old. Thanks, Terry, for a wonderful story about your experiences at The Masters. Thanks, Sara. I’ve been fortunate. Safe travels Terry. I think about that weekend quite a bit. Can’t wait to watch this year now that I have actually seen the course. Appreciate, ‘Ber…You were a trooper last year handling those vaunted hills after coming off the DL! Very proud of our hometown guy. Not only a terrific writer/journalist, but an all-around great person. Nice of you to say, Maryann. Made time to read this this morning. Congratulations on many wonderful experiences. Likewise on how you share them with all the readers. Thanks for the comments, Joe. Enjoyed the article Terry. Have fun! thanks for being literate, Pat!